Chris Sailer Kicking – Week 5 College Players of the Week, JJ Molson & Drue Chrisman Honored! Recruiting Update – Jared Smolar is the TOP Combo Player Available! The 2015 Chris Sailer Kicking Summer Tour is going strong. Instruction, Competition, Scholarships, All-American selections have all been a part of it. We have seen well over 1,000 athletes already this summer. So much has happened and so much is yet to still happen. One player making waves, is long time Chris Sailer Kicking combo player Jared Smolar, a 2016 prospect from Indiana. 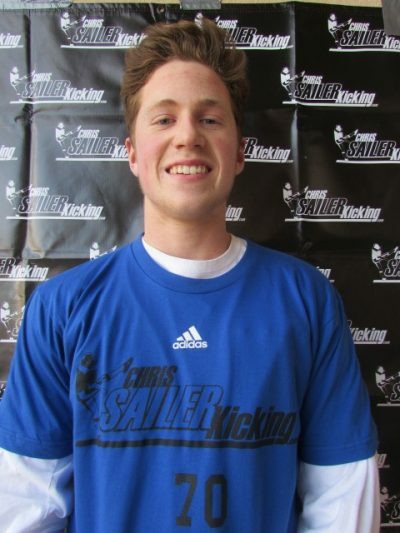 Jared has trained with Chris Sailer Kicking since his freshman year of high school. He has developed into a big time D1 scholarship athlete. He is proving his worth by dominating all three kicking skills (field goals, kickoffs, and punts). He shows 60 yard field goal range off the ground. His kickoffs are perhaps the best in the nation, averaging 70-75 plus yards and 4.1+ hang time. Punting is also a major strength. Most importantly Jared is a tremendous athlete that competes with great confidence. He recently was inches away from earning the 2016 U.S. Army All-American selection. Jared will excel at the D1 college level. He is far and away the #1 available combo prospect in the nation. OFFER NOW!!! Stay tuned to find out where Jared Smolar will commit! Jared Smolar, #1 available combo prospect in the country! Vegas XXVI – What You Need to Know! Vegas XXVI in Las Vegas, NV is less than a month away. While many specialists are taking this time of year off, those that seriously want to play in college and know what it takes are working harder than ever. Those hard workers will be in Las Vegas May 9-10, 2015 ready to impress and gain the most valuable national exposure in the nation. Here is some useful information for those attending and those that are still considering attending. • Arrive Friday May 8th. The earlier that you arrive, the more well rested you will be for the weekend. • Plan on being at camp until 4PM Sunday May 10th. There is no way of knowing if you will make the Finals Round Sunday until you and all other participants have completed the initial round of charting Sunday morning. Whether you make the Finals Round or not, you should plan on staying on watching the Finals Round. Get the full experience from the camp! • There is no bleacher seating. Bring chairs or buy some cheap chairs if you would like to sit while you watch. • Why May? May is also known as “Evaluation Period” for college coaches. This is a very HOT time for recruiting for all classes. May offers maximum exposure. Chris Rubio and myself will be handing 100′s of calls after this event. Recruiting Boards will be set based on results and our evaluations. Want to be offered a scholarship at those college camps this summer? Attending this camp is how they will know about you! • It is no surprise that from Vegas XXV in January that the “TOP 12” are already getting major attention and full scholarship offers. Who will be next? • The Spring Event in NOT an Invite Only Camp. This camp offers a great experience to kickers, punters, and long snappers of all levels. Expect a wide range of talent from beginners to the best of the best from around the world in the Classes of 2019, 2018, 2017, 2016, 2015, Junior Colleges and 4-Year Transfer Students. The best of the best, The “Event Elite”, selected from the Spring Event will be invited to attend the “TOP 12″ and “Event Elite” Camp in June. • Come prepared to enjoy your experience. Do NOT put to much pressure on yourself. Come with open eyes and ears. Learn from your instructors and your peers. Look around and take it all in. Watch other groups. Watch the college and pro demo. Attend the Meetings. There are so many things to learn and that you can and will benefit from if you take advantage. Leave the camp with goals and a motivation to work harder than ever! • Saturday – Instructional Day. You will get plenty of reps. Pace yourself. Saturday ends with a Chris Sailer Kicking Original Last Man Standing Competition. Your group numbers will be emailed to you about a week prior to camp. • Sunday – Competition Day. You will be charted. You can compete in 1, 2, or all 3 skills. This is up to you. Your competition start time will be assigned to you at Check-In Saturday. • Those that just punt – you are automatically in Group #2 on Saturday. • Class of 2019, 2018, 2017 and 2016 – You may use tees up to 2″ for both Field Goal and Kickoffs. The choice is yours. Class of 2015, JC, and Transfers you must kick off the ground for Field Goals and use a 1″ tee for Kickoffs. • Saturday Meetings are the the Group Rate Hotel – JW Marriott. I highly advise that participants and their parents attend. Get there early and enjoy. • What makes Chris Sailer Kicking the best in the business? 1st National Camp Ever for Specialists. 1st Kicking Company to ever to rank Kickers, Punters, and Long Snappers on a true national scale. Chris Sailer is physically at EVERY camp associated with Chris Sailer Kicking. Chris Sailer is the ONLY one that handles the evaluations and rankings for the Kickers and Punters. Same holds true for Chris Rubio with the Long Snappers. 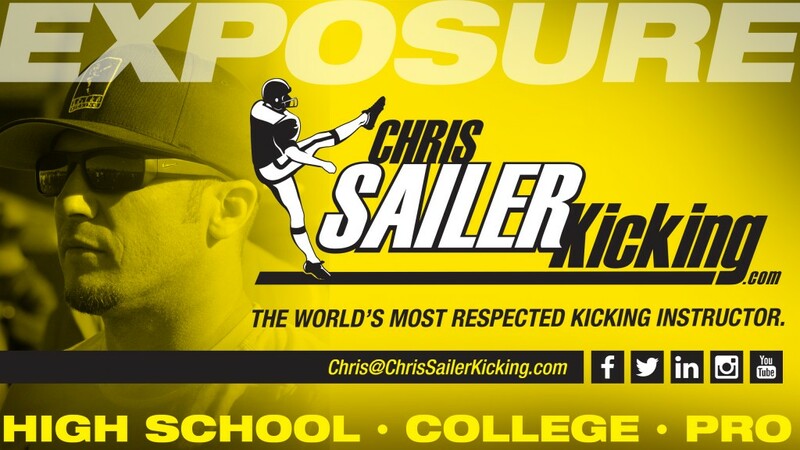 Talk to any college coach in America or any kicker or punter that has been to multiple camps and will see that Chris Sailer Kicking is the place to be for the best possible instruction and exposure. Our advertising is word of mouth. Come see for yourself! See you in May! Chris Sailer Kicking made a recent stop in Charlotte, NC on the second stop of the Spring Tour. Over 100 specialists from the region attended hoping to impress. The group provided a good mixture of veterans and new comers to the program. The weather cooperated very well and gave an accurate depiction of the regions top talent. Take a look at the results. Luke Carter (2015) – Luke is a long time Chris Sailer Kicking student who continues to excel. The combo player caught fire in the finals round. Luke has a strong leg and kicks with excellent consistency. He has all the tools to take his game to the college level. 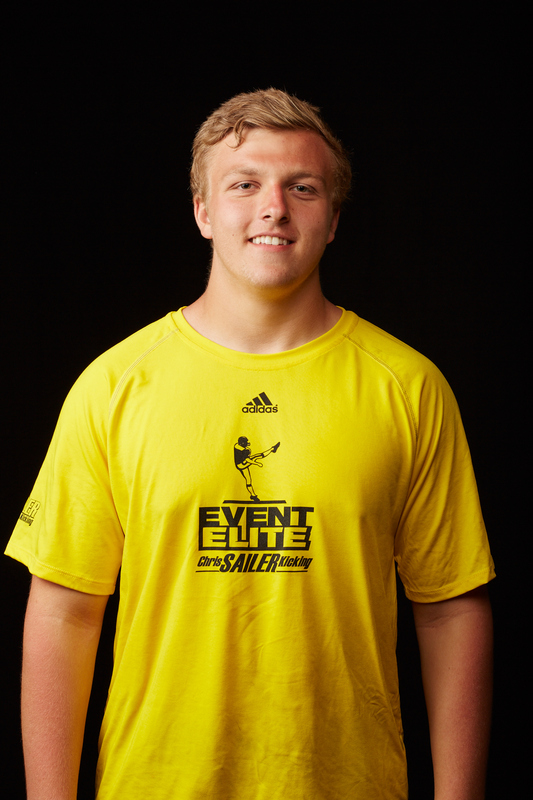 Tyler Gallitz (2015) – Tyler is another long time student who kicks with great consistency. His field goals were solid all day long. His kickoffs and punts also show great promise. Tyler should have a strong off season and impress college coaches around the country. Nice prospect. Michael Rubino (2015) – Michael proved once again to be the most talented kicker in the North Carolina in the Class of 2015. He is a great athlete with huge upside. His field goals get outstanding height off the ground. His kickoffs are D1 ready. Michael is a D1 Scholarship Pick! 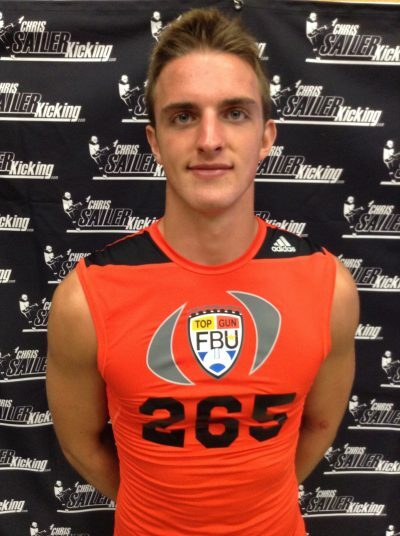 Steven Sawicki (2015) – Steven won his second consecutive NC punting championship. Steven punted for nice distance and hang time all day. Steven has the tools to be an outstanding D1 punter. Keep a close eye on this talented prospect this summer. Evan Rabon – Evan continues to impress each time that we see him. His field goals are strong off the ground. His kickoffs are nearing college ready and his punting is coming along nicely. He’s a fine young man that will make a great college fit. Other Class of 2015 Standouts: Ben Utter, Josh Boham, Marion Watson, Nick Marshall, Shea Rodgers. Jonn Young – Jonn has the ability and potential to be special. He’s a great looking athlete that shows flashes of being one of the very best. Also a solid punter. He will only continue to improve over time. Keith Duncan – Keith really stepped up on this day. 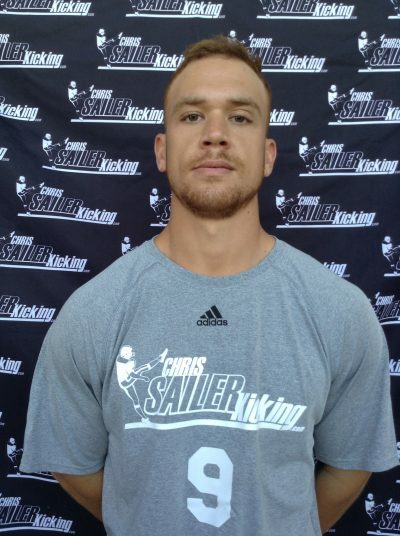 The Chris Sailer Kicking veteran continues to improve at an impressive rate. His field goals were very consistent all day long. His kickoffs are showing college level potential. He has a bright future. Jaxon Clark – Jaxon is a great young kicker. His field goals and kickoffs are nearing the top of his class. He is one of the hardest workers in the country and it is paying off. Kyle Corbett – Kyle has the potential to be one of the very best. He has a very strong leg and shows outstanding range on field goals. His kickoffs are also coming along nicely. Other Class of 2016 Standouts: Gage Russell, Henry Atkeson, Jonathan McDaid, Seth Kujawski. Class of 2017 Future Stars: Aidan Marshall, Christian VanSickle, Cooper Graham, Clayton Howell, Jacob Grimm, Zach Stearns. Chris Sailer Kicking will next travel to Chicago, IL (March 30), Dallas, TX (April 27), and Los Angeles, CA (May 4). The Spring Camp Tour will conclude with the 12th Annual National Kicking Spring Event in Las Vegas May 10-11, 2014! Chris Sailer Kicking is an official partner of FBU, the U.S. Army All-America Bowl, and East Bay All-America Games. The Road to the U.S. All-America Bowl & East Bay All-American Games begins now. 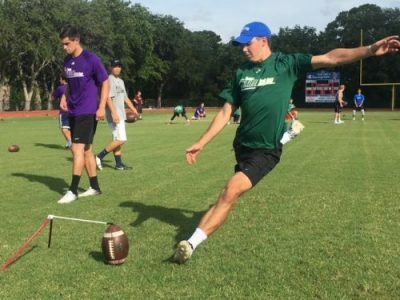 Chris Sailer Kicking at FBU Camps: Central Florida (April 4-5), Dallas, TX (April 25-26), San Diego, CA (May 2-3), Seattle, WA (May 16-17), Los Angeles, CA (May 30-31), Central Ohio (July 11-12). Email Chris@ChrisSailerKicking.com to inquire about an invitation to these prestigious camps. Chris Sailer Kicking “TOP 12” K/P Logan Cooke Commits to Mississippi State! Longtime Chris Sailer Kicking student and “TOP 12” Member Punter/Kicker Logan Cooke has committed to Mississippi State. He chose Mississippi state over an offer from Louisiana Monroe. The highlight recruited Combo Player has always had Mississippi State listed as his dream school, so when they offered he had no hesitation when it came to committing. Logan is a big time talent. He has attended multiple Chris Sailer Kicking camps and has impressed since day 1. Each time he progresses at lighting rate. Although I see him as a Punter / Kickoff guy, he also has huge field goal ability. Overall, he is one of the very best prospects in the nation without a doubt. I expect him to have a huge college career. Well deserved!